Intel hopes Clarksfield and Arrandale will bring scaled down Core i7 type performance to laptops. But you can’t get your hands on it until this Fall, if you’re lucky. Processor microarchitectures, barring those specifically meant for mobile devices, like Atom), appear on desktops before they find mobile users. Laptop users generally wait for months to get their hands on the CPU tech that is found on the desktop. With all of the fanfare that accompanied the first Nehalem processors, the Core i7 line, and the impressive performance these chips have, the wait for notebook fans seems all the longer. 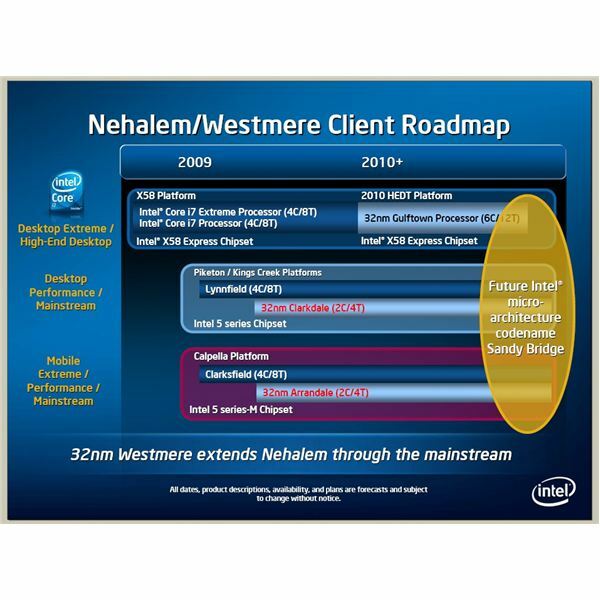 Originally, Intel was going to let the laptops in on the Nehalem party in the first half of 2009, with two processor families: Clarksfield, the laptop version of the desktop, 45nm, quad-core Lynnfield; and Auburndale, the laptop equivalent of the two-core Havendale. These chips would have some of the Core i7’s attractive features, such as an integrated memory controller to cut down on bandwidth bottle necks, and Hyper Threading, which makes one core act like two. 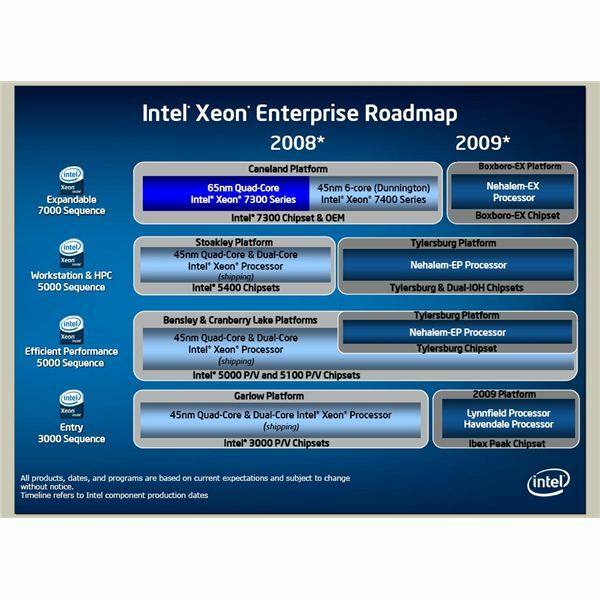 Intel’s road map from last August (right) shows that state of affairs. But Auburndale and Havendale have been dropped, and Clarksfield and Lynnfield have been pushed to Q3. 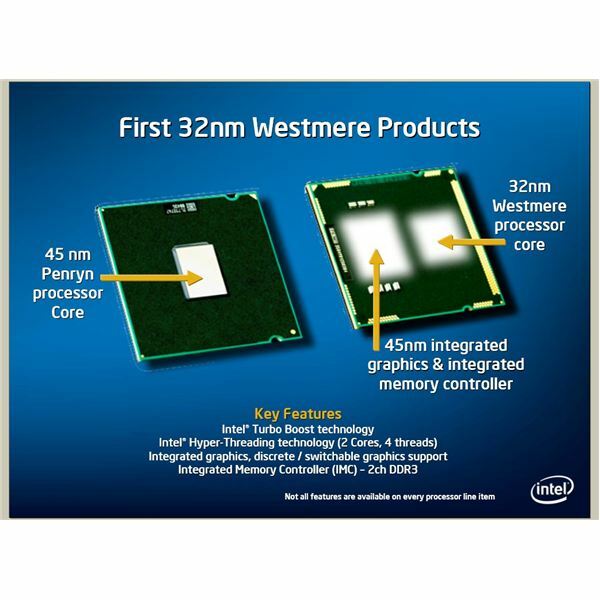 Intel has decided to hold off on the dual-core Nehalems for desk and laptop until the 32nm, Westmere versions, called Clarkdale and Arrandale, respectively, are ready; as soon as the end of this year. We can see the roadmap from February 2009 on the left. Comparing it to the one above from last August, we see the disappearance of the first ‘dales and the cusp of year appearance of the new ‘dales (sorry, no word from Intel on Chippendales for your desktop, let alone laptop, if you’re into that kind of thing). We can also make out the pushback of the Nehalem quad-cores. (Sorry, I couldn’t think of a joke to go with ‘fields: out of left field, playing the field? I can’t make them work.) It looks like these roadmaps are (reasonably) to scale, which is not by any means to be assumed of product roadmaps. The streamlining and delay is likely due to weak consumer demand, but it also makes more room on the CPU to include the integrated graphics Intel will put on these processors. See the diagram below. The dual and quad core processors, coupled with an Ibex Peak-M (for mobile) chipset, will come to market as the Calpella platform, which we will cover in another article very soon. And woe to the laptop buyer. Digitimes reported on the 5th that unnamed notebook manufacturers were asking Intel to hold off on the July release of Calpella until October. They needed more time to clear existing Centrino 2 inventories. On the 10th, the other shoe dropped. Intel told notebook OEMs they would adjust the Caplella release. Intel, nice guys that they are, also said that they wouldn’t make expected price cuts on Centrino 2 until June. That way, buyers will be less tempted to wait for the price drop. In all fairness, Intel should have seen this coming. Most people had figured out something was wrong with the economy last October or even September, and Intel knew that it was unexpected success of the netbooks using the Atom that was driving their mobile product sales. Slowing down the research and investment they were putting into developing new chips wouldn’t have been applauded by users; but we would have to see where Intel was coming from. And it’s not like we, collectively as consumers, have a lot of money to spend on new processors right now. Shareholders would have been thrilled by Intel’s ability to cut costs preemptively, and would have had a less stressful reporting season. Perhaps out of their inexplicable devotion to Moore’s Law, Intel just had to get the chips done, even if they can’t sell them until later. So shareholders paid for tech they can’t sell. Act IV: What Is AMD Going to Do about It? I know I said three acts, but this tale of waiting, denial, and some would say treachery, is anything but over. On the consumer side, ths deliberate move from Intel is like smelling the freshly baked bread coming out of the oven in back, and being told the fresh loaves won’t be available until the bakery is sold out of day-olds. And charging full price for the day-olds, no less. You would walk out, perhaps with some choice words for the baker regarding his business practices. And that is why even devout Intel users like it when AMD launches something fast and cheap. By not competing effectively on the mobile front, they the Red Team allowed the Blue Team this chance to clear inventory. Hopefully, AMD can come up with something good this year when they launch Caspian, their mobile dual-core, 45nm, CPU. Otherwise, it’s going to be a slow year for notebook CPU technology.